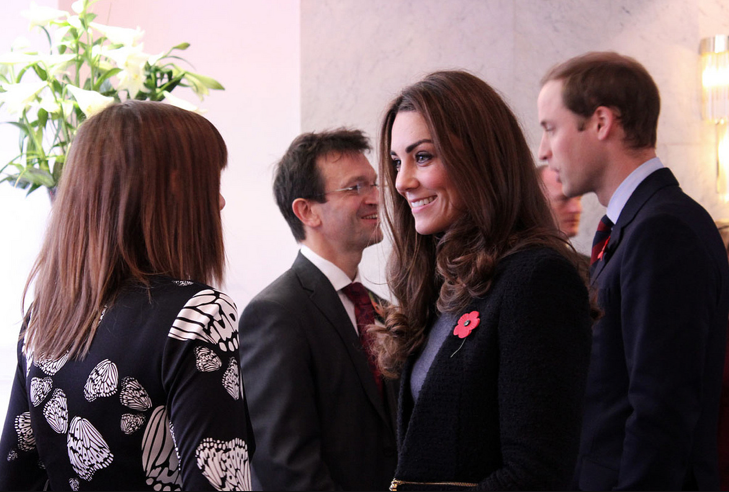 We share a very brief post, yesterday Kate and William attended the Princes’ Charities Forum. Kate wore Zara’s ‘Blazer with Zips‘ a blue top or dress can be seen underneath the jacket. Credit for identifying this goes to WKW Facebook friend Stella, as well as Gwen. The jacket is a wool blend with acrylic, polyester and nylon fibers. Here is a another photo of the blazer, better showing the detail and fabric texture. Thank you Simona on FB for letting us know about the detailed picture. The blazer was a summer item, it is sold out at most online Zara sites, but several readers have had luck finding it by contacting local Zara stores. It was originally priced at Â£79.99, $129 USD, when in stock this summer. 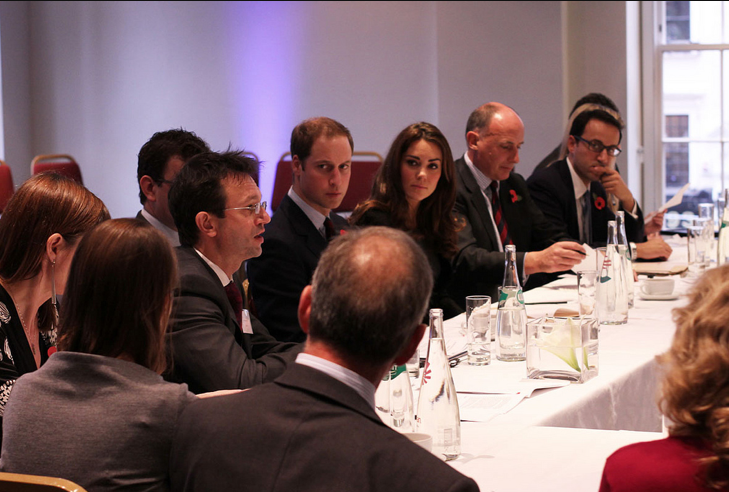 Forum meetings are held biannually and provide an opportunity for the Charities to update The Princes on their recent events and ventures, and to talk about their strategic objectives. The Forum has evolved into a means of collaborative activity between the participating Charities and organisations. Opportunities to support each other are explored at meetings, relationships are developed and bilateral work is initiated. The meetings were held at BAFTA headquarters, many readers will recall from this summer’s gala BAFTA dinner in Los Angeles that Prince William is president of the group. I bought this jacket in Prague about 2 weeks ago. I simply love the jacket. I wonder if I can find it in Italy as well. In Spain it is in stock in ZaraÂ´s stores, at least a pair of weeks ago!!! I love that she’s wearing a jacket that was only Â£79.99. Honestly, enough said… right. She has loads of cash but chooses simple, stylish, and affordable quality pieces. Love her for it! I like the jacket, but then I enjoy Zara’s designs — interesting, unusual, but not high-priced. I’m puzzled by an earlier comment about the blouse being “patterned”. I can barely see the blouse (or dress), and since the jacket is a solid color, I’m not sure why a patterned blouse would be a problem. Moreover, the design is youthfully “different,” not aging. Anyone want to sell me one if they have it? Let me know, Ill send my email. I love classic pieces with little details that make them more interesting/unique. The zipper blazer is definitely a winner. Agree…the zipper makes it a little more hip, IMO. I like it on her. I think the zips on the jacket are a little on the strange side… Are you supposed to be able to unzip the bottom part and wear it as a shorter shrug as well? Or are they just for decoration?I don’t know, this just isn’t for me, but the Duchess looks lovely as always! Some more news on Kate, who has been taking shooting classes, it seems, as a preparation to her christmas with the royals. Not a fan of the blouse with the blazer, so much pattern in the blouse and distracts from the rest. A simple white blouse with that blazer would work but not a fan of the outfit in general..it ages alot!. LOVE the jacket! 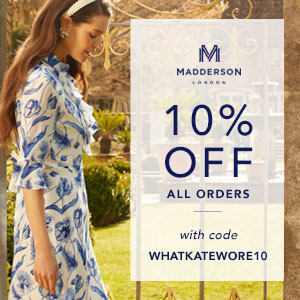 It is perfect for Kate and I want one to wear to work. The zipper detail is perfect: fashionable, figure flattering and edgy without making the jacket unprofessional. I wish we had more pictures of how it looked on Kate. I love that jacket and hope Zara bring it, or something similar back.